Encontrei 10 Hotéis em Courmelois. Escolha a data de entrada e saída para ver os hotéis disponíveis em Courmelois. Sem informar as datas, os preços com (*) são preços médios de cada hotel e nos arredores até uma distância de 10 km. Set in Val-de-Vesles in the district of Courmelois, 17 km from Reims, Les chambres d'hôtes Joy features free WiFi access and free private parking. Each room is fitted with a TV. Some rooms have a seating area for your convenience. You will find a coffee machine and a kettle in the room. Each room includes a private bathroom. For your comfort, you will find free toiletries and a hairdryer. The guest house also offers bike hire. Épernay is 23 km from Les chambres d'hôtes Joy, while Châlons-en-Champagne is 26 km away. Vatry International Airport is 43 km from the property. Set in Les Petites-Loges, 21 km from Reims, the bed and breakfast Le Trilogis features air conditioned room and free WiFi throughout the property. Le Trilogis has a garden. Guests will find vineyards in the surroundings. Chalons en Champagne is 25 km from the property, while Épernay is 22 km away. This property is easily accessible from highway A4 and A26. Offering a sun terrace and views of the river, Serenity Barge is set in Reims. Extras include free toiletries and a hairdryer. Serenity Barge features free WiFi throughout the property. The nearest airport is Vatry International Airport, 52 km from the property. Featuring free WiFi throughout the property, La Bertonnerie en Champagne offers pet-friendly accommodation in Prunay, 10 km from Reims. Free private parking is available on site. Each room comes with a flat-screen TV. Certain rooms have a seating area where you can relax. You will find a coffee machine and a kettle in the room. All rooms have a private bathroom equipped with a bath or shower. For your comfort, you will find free toiletries and a hairdryer. You can play table tennis at this bed and breakfast, and bike hire is available. Épernay is 24 km from La Bertonnerie en Champagne, while Châlons-en-Champagne is 32 km away. The nearest airport is Vatry International Airport, 49 km from the property. Located near the Reims-Prunay Airfield, this hotel features views of the airfield and airstrips. At the foot of the Montagne de Reims, L'Escale offers modern rooms with free Wi-Fi. The guest rooms at L'Escale feature wooden floors. Each is equipped with satellite TV channels and has a private bathroom. The Escale’s restaurant serves traditional cuisine, and guests can enjoy an after-dinner drink in the bar, which overlooks the airfields. L'Escale is in close proximity to the Champagne vineyards and is just a 5-minute drive from central Reims. For guests coming by car, free private parking is provided. On the Champagne route, this guest accommodation offers rooms and apartments with free Wi-Fi and vineyard views, as well as Champagne tasting. Guests are welcomed to join in the daily spectacles hosted on site to find out more about Champagne. An en suite bathroom with free toiletries is included in each room and apartment. All have a flat-screen TV and the apartments also have a fully-equipped kitchenette. A continental breakfast can be ordered in the morning. Guests can also be entertained by an informative 1-hour show about the development of the Champagne region, which is projected every day. Regional products can be purchased from the on-site shop. In the regional park of La Montagne de Reims, 10 km from the Zig Zag Amusement Park, Pré en Bulles is 8.9km from Arboxygène in Verzenay and 26 km from Reims. Verzenay‘s wine museum, in the form of a lighthouse, is 8 km away. Private parking is free on site. Built in 1930, this winery offers B&B accommodation 12 km from the Abbey of Saint-Remi. It offers free Wi-Fi access, individually decorated rooms and a garden with trees. All the heated rooms at Domaine Ployez-Jacquemart offer a private bathroom with free toiletries and a bath. Some have a four-poster bed and romantic furniture. Guests are invited to enjoy a buffet breakfast every morning at Domaine Ployez-Jacquemart. Meals prepared by the hosts are also available on request. Wine tastings can be organized at the property. This B&B is a 20-minute drive from Reims Cathedral and 12 km from the A4 motorway. Free private parking is available on site. 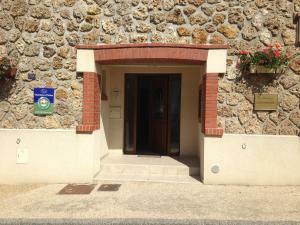 B&B Le Chardonnay offers accommodation in Nogent-l’Abbesse. Every room is fitted with a private bathroom fitted with a bath or shower. The area is popular for cycling and hiking. Reims is 9 km from B&B Le Chardonnay, while Épernay is 27 km away. Featuring free WiFi and a hot tub, Clos du Mont Rouge offers accommodation in Bouzy. Free private parking is available on site. Some rooms feature a seating area where you can relax. Extras include bathrobes, free toiletries and a hairdryer. Bike hire is available at this bed and breakfast and the area is popular for cycling. Reims is 22 km from Clos du Mont Rouge, while Épernay is 15 km from the property. Vatry International Airport is 34 km away. Situado apenas a 5 km do centro da cidade e da catedral da cidade, o Best Hotel Reims La Pompelle está localizado perto do Parque Industrial Pompelle-Farman e de Cormontreuil, a 1 minuto do Centro de Exposições de Reims e a 5 minutos de algumas das adegas de Champagne mais famosas da França (Veuve Clicquot, Pommery, Taittinger, Ruinart). Os quartos estão equipados com uma casa de banho privativa e incluem uma televisão de ecrã plano, um telefone e acesso Wi-Fi gratuito. O equipamento para engomar está disponível na recepção, mediante pedido. Os hóspedes podem desfrutar de um buffet de pequeno-almoço à discrição, servido todas as manhãs no salão partilhado, assim como de uma bebida no bar. A propriedade alberga um restaurante tradicional que serve uma cozinha francesa e internacional. Outras instalações disponíveis englobam 12 salas de reuniões. Localizado apenas a 10 minutos da Estação Central e de TGV de Reims Champagne Ardenne, este Best Hotel é ideal para férias e viagens de negócios. A propriedade oferece estacionamento gratuito no local.